Windsor offers a nationwide installation service for any of the products it supplies. All engineers are trained and fully skilled technicians, managing installations and media set up, in a wide variety of locations, including A/V, projection displays, video walls and digital displays screens. All technicians are fully trained to deal with all aspects of health and safety and fully insured to carry out work in a wide range of public areas. Usually, we manage to arrange for shipment within 24 hours of receipt of cleared payment. If you have a credit account with us, shipping would be within 24 hours of receipt and acknowledgement of order. When ordering from our range of digital display screens or projectors, please allow an extra working day before these can be shipped out. This allows us time to quality check the screens/projectors so that they are in full operating order when you receive them. Delivery prices will vary depending on product, value, size and quantity. Feel free to give our sales team a call to check on shipping costs. For custom made products, please ask for expected lead times as these can vary depending on product. We work with many design agencies and understand only too well that sometimes projects can be very time critical. If you are involved in such a project, call us to discuss at an early stage, so that we can fully help you achieve your deliveries in good time. 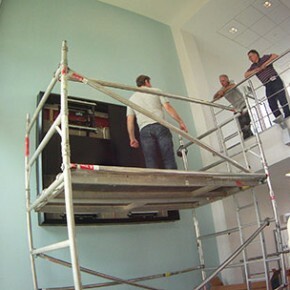 I would like to say thank you for all your hard work in the organisation and installation of the Video wall to Babraham Campus. The project was a great success with equipment being delivered on time and the professionalism of yourself and your install team. We have received excellent feedback from end users on the quality of the build and picture clarity.